(R.R.P. £379.99). Fabulous quality! 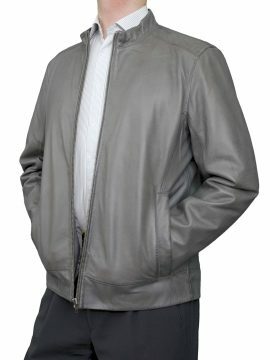 A men’s leather blazer jacket that is perfect both for smart wear with trousers or a more casual look with jeans. 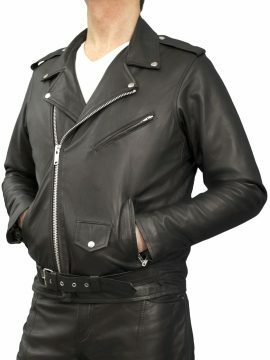 It is tailored in luxury quality lambskin nappa leather produced exclusively from British hides. The leather has a special hand-waxed finish which also imparts a subtle shading effect visible on the tan, grey and blue shades. 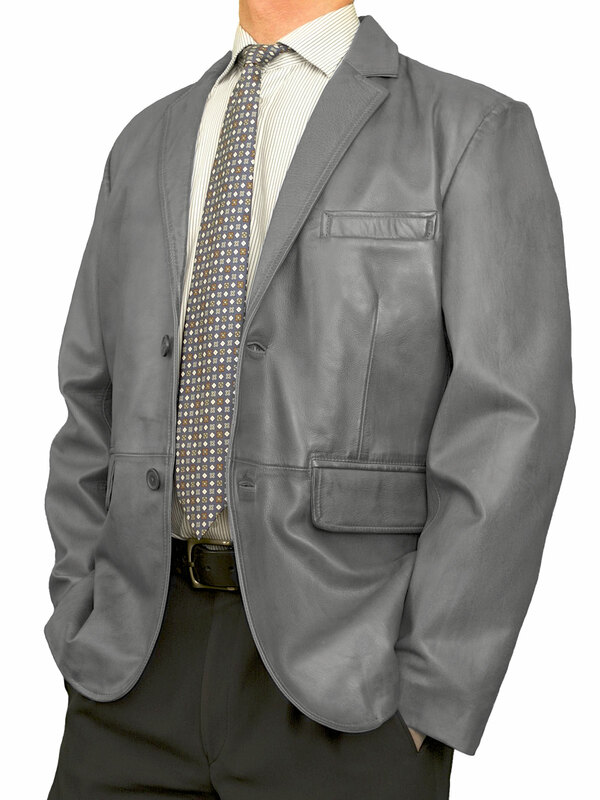 The jacket is in the traditional single-breasted style with a two-button front fastening, and has a breast pocket plus two front pockets with flaps that can be worn tucked in, if desired. There is a single vent at the centre back. The high quality lining is in a plain matching colour in the back, and grey/white stripes in the front. 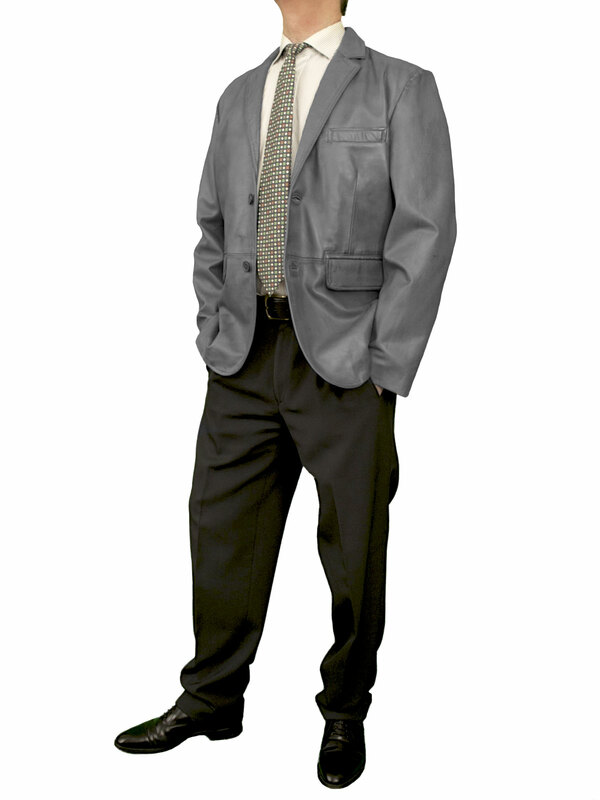 There are 3 inside pockets, one with a zip fastener and one with a single button fastening. Available in 5 colours: black, dark brown, tan, grey and blue (light navy). 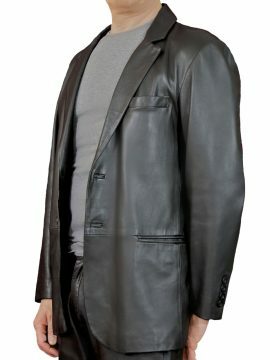 A luxury quality men’s leather blazer jacket by Ashwood tailored in soft smooth lambskin nappa leather that is produced exclusively from British hides. Perfect for smart or more casual wear with trousers or jeans. Available in a choice of 5 colours: black, dark brown, tan, grey and blue (light navy).